I’m pretty sure I have the second best job in the world. My friend and I were talking the other week and the conclusion was that working on Google doodles would be the very best job in the world. I don’t know anything that makes so many people happy. Unfortunately, neither of us can draw. Today, I want to talk to you about world changing. I get very excited about world changing. I’m going to take it from three angles – art, data, and people. I’m going to try and convince you, that if you’re an idealist – if you used to daydream (or still do) about being a superhero then being a software engineer is one way to achieve that. I’m going to try and explain why I love what I do so much. One of my mentors described me as a “social animal” – this is ridiculous because we’re human – we’re all social animals. I guess software engineers are often the glaring, anti-social exception to the rule. But, I love people. Particularly, I love connecting people. At the moment I’m involved in Girl Geek Dinners in KW, which is about connecting women in tech to one another, and Awesome Foundation KW, which is about connecting people with awesome ideas to amazing people who love their idea and will give them money and help them make it reality. By day, I work on mobile social. 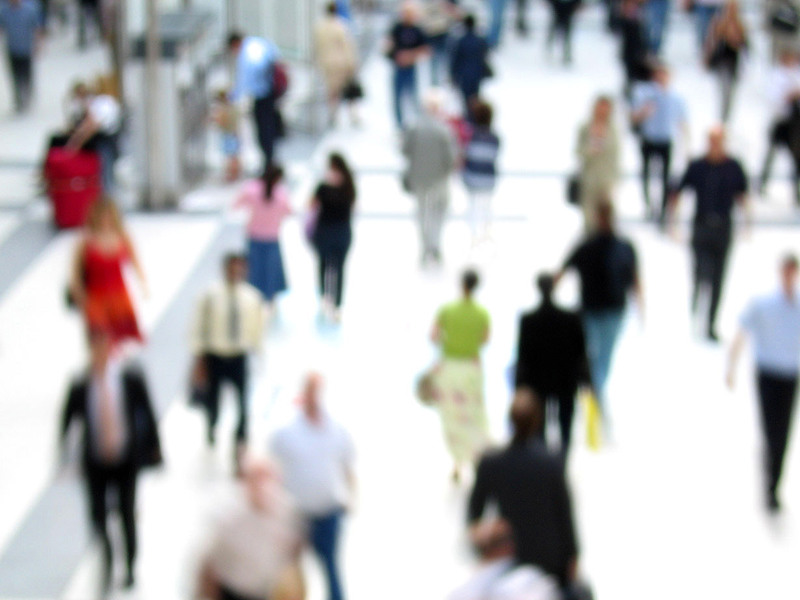 We want to connect people, you, to who and what and where will be interesting. I moved in the fall, and I found out what was going on and met people via Twitter but it’s still not easy, and there are a lot of ways that we can do better at enabling real-world experience through software. What does this have to do with world-changing? It turns out that when you connect people in new ways, they make new, incredible things happen. Data might be the most promising tool to address some of the biggest challenges humanity faces. New kinds of technology has meant new means of creating art, and in fact, that art can be a helpful tool in telling both of these stories. Movies have long pushed the boundaries of what is technically possible. I love that video because I think it’s a lighting view of how technology has progressed over the last 100 years. I watch it, and it makes me excited for what happens next. What does this mean for world-changing? Second Life is an online virtual world – what if it could help people who are disabled experience things they otherwise couldn’t? 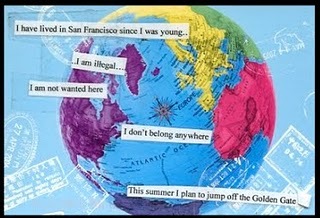 Postsecret is an online, collaborative art project. People send in their secrets on post-cards, and a blog-post collecting some is published each week. I look forward to it each week – sometimes hilarious, sometimes sad, always thought-provoking. But, more than being an art project – a postcard someone sent in prompted a campaign against suicide on the San Francisco Bay Bridge [video]. A Facebook fan page titled “please don’t jump” was created, and gathered over 6000 fans. People gathered on the bridge to release balloons and leave flowers and messages of hope. In fact, one of the people there missed the group, but ended up talking someone down from the ledge. An art project – hosted on Blogger – but because of the way communities can connect online, it became a movement for hope, for those who need it. This is one of my absolute favorite projects, I saw it live for the first time in New York in the fall and I was completely taken with it – it’s actually interactive. To me it represents the intersection of art, and programming – which is why I love it so much. But it also shows us the stories we can tell using visualization. There is a mind-blowing TED talk by Hans Rosling. It’s literally called “Hans Rosling shows you the best stats you’ve ever seen“. It’s amazing. I’m going to show you a shorter, but equally mind-blowing talk. The graph he’s using gives a fourth dimension to the data, because the movement shows the passing of time. The animation helps him tell a compelling story. There’s more information put online every day, than you can hope to read in your lifetime. 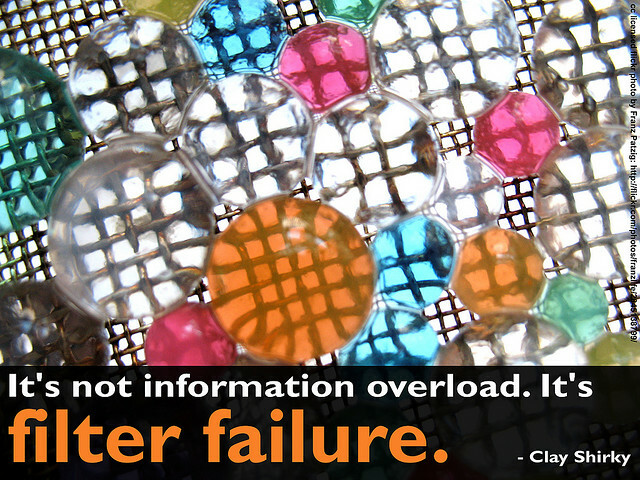 And so we talk about the data deluge, and filter failure. Data is also an opportunity. Google used the sheer volume of data available for crunching to improve machine translation. 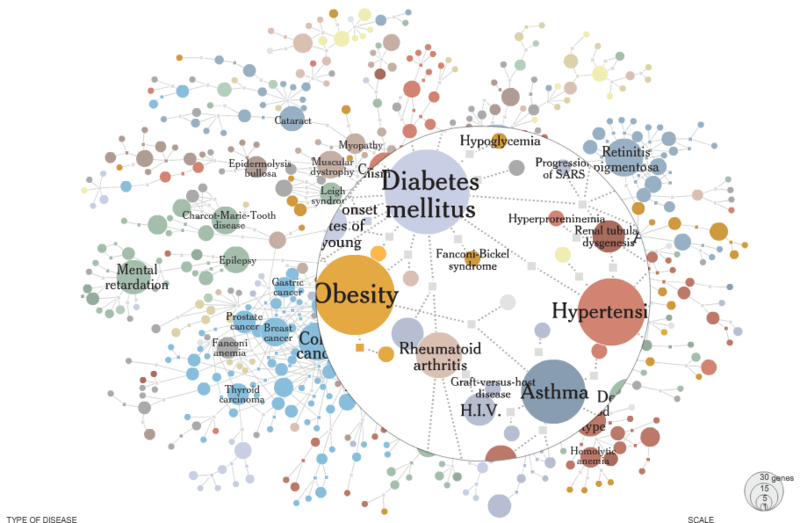 Mapping the Human ‘Diseasome’, an interactive graphic – see it at the New York Times. There was a lot of data that we had, but with no sensible means of making sense of it, what was the point of collecting it? Now – I think data crunching on a huge scale will be the biggest source of improvements in healthcare over the course of the next century. I was trying to explain to someone non-technical what I did recently, and it wasn’t going well. Eventually, she said, “oh – you work for the internet”. I didn’t know what to say to that, and then we started running these chrome ads. Every one so far has made me cry. They make me think, yes, I do work for the internet. We can talk about “the Facebook Revolution” – it’s exciting. It’s important. But every day there are small but significant things, where people are using the internet to connect and help each other. Like Kiva. Kiva is a site for micro-lending, it allows users to make loans to people in developing countries so that they can grow their business and hopefully lift themselves out of poverty. Many people prefer to loan to women, because they use the money to support their families with education, healthcare etc. It’s not a one-to-one relationship. Loans are split into $25 chunks and a number of different people contribute to make up the loan amount. Recently a British footballer had an… interlude with a Big Brother housemate. Why am I telling you this? Despite watching Keeping up with the Kardashians in times of stress, it’s not the kind of thing I’m normally interested in. But this footballer wanted to keep this a secret, as you would – right? Big Brother housemates do tend to be rather… odd. So he took out something called a “super-injunction” to stop news outlets publishing the story. Thing is, everyone knows who he is because this snippet of gossip has been tweeted by 75,000 people. Do we really need these details of celebrities lives to be public? No. But the world has changed, and everyone can be a publisher now, even if they limit themselves to 140 characters or less. And this changes the rules of the game. It’s hard to have the same threat over so many people (and you don’t even know who they are!) as you can over a finite number of news outlets. The old system of trading favors and coercion doesn’t scale. The US government was playing whackamole trying to shut down wikileaks. Wikileaks just made it easy for people to mirror the site. There’s a fascinating book called Bloggers on the Bus (Amazon) which is all about how bloggers changed the last US presidential election. In the UK, MPs expenses were investigated by crowd-sourcing. Everyone has the option to be a media outlet now. An unimaginable number of people are taking it. Software, like Blogger and WordPress make it really easy. Technology is like any other tool. You can use a hammer to build a house, or you can use it to attack someone, similarly you can use the tools available for good – or for evil. We can cheer each other with lolcats, or we can torment with rickrolling. The internet can be the ultimate procrastination tool. Wikipedia and Google Docs can make you more effective at studying. Endless videos of cats and social networking can mean nothing gets done. A group of unconnected strangers can fund a business in a developing country and help someone lift themselves out of poverty. But teenagers (and non-teenagers) can find new ways to torment each other using social media. It’s possible to start a revolution online, now. But it’s also possible for governments to invade people’s privacy and watch them like never before. I’m hoping you’ll leave here with knowledge of some new superpowers today. Ultimately, it’s up to you what you do with them. I hope, though, that you won’t be evil.